NEW! We now have soy-free non-GMO chicken feed. Feed up to 2 pounds of Pine Creek 14% Sheep & Goat per head daily. Provide a continuous supply of clean, fresh water. Do not exceed 0.3 ppm added selenium from all supplemental sources in the total ration. This feed does not have any added copper. This premium all natural feed is blended with grains that have been lab tested and meet the highest levels of purity. 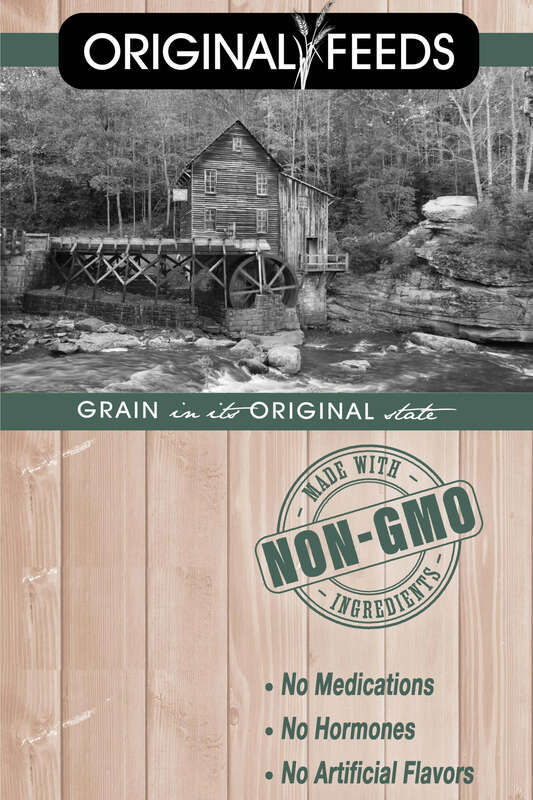 The ingredients typically found in this feed are as follows: Non-GMO corn, Non-GMO Soy, Non-GMO Alfalfa Products, Non-GMO molasses, Small Grains and Minerals that are naturally Non-GMO. There are NO medications or growth hormones in this feed. It’s what’s NOT in the feed! We’re here to help – please contact us for assistance! Thanks for joining us in our pursuit to raise truly natural and the most healthy livestock. From the staff at Pine Creek Farm and Feed. © 2019 Original Feeds. All Rights Reserved.